Traditionally called pissaladière, this savory tart originated in Nice in the south of France. You can find versions of this tart in every boulangerie or bakery in the city, and it's considered one of the best examples of Niçoise street food. Luckily, it's also easy to make at home! The filling consists of slowly caramelized onions, cooked until they are sweet and well browned. 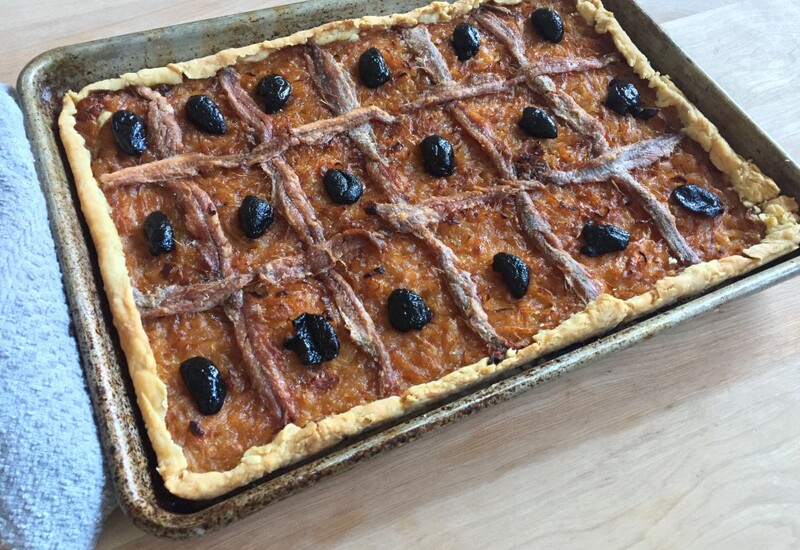 The onions are topped with salty anchovies and black olives, all spread across a buttery crust. Serve the tart with a simple green salad and a crisp glass of white wine and you'll be transported to the cobbled streets of Nice. Do not overwork the dough or it will be tough when baked. The trick with butter crust is to knead it so it just holds together. It may crumble a tiny bit when you roll it out. That's okay—put it in the pan and fill the gaps any which way you can. It's a rustic tart, and doesn't need to be perfect. Per Serving: 692 calories; 60g fat; 35.4g carbohydrates; 5g protein; 23mg cholesterol; 95mg sodium. This french onion tart was a lot easier to make than I expected. It's a very savory dish, and the butter crust is amazing. One of the best french onion tarts I've ever tasted! It's perfect as an appetizer or served with a simple salad. We will probably make again for Easter.